We live in a world where people document their every move. From blog posts where people share the intimate happenings in their lives to selfies where people share pictures of themselves throughout the day to brief Twitter posts where people share such mundane details as what they ate for lunch, we’re a nation of sharers. Now, that sharing has gone even further with a new trend: writing your own obituary. The recent death of character actor James Rebhorn has helped bring national attention to this new trend. Rebhorn wrote his own obituary. In the obituary, he urged “his children to mourn him only as long as necessary because ‘they have much good work to do, and they should be busy doing it,'” and he also said that he “considered himself a lucky man in every way”(USA Today). The selfie obit, as the media is calling it, allows the writers to share exactly how they feel about the life they’ve lived, the family and friends they have, as well as how they want to be remembered. I imagine a selfie obit could also be incredibly comforting to family and friends, sort of like a last message from the grave. Plus, since the deceased had previously written the obituary, there’s one less task for the family to take care of when they’re in the midst of greiving. End of life planning, for those who aren’t afraid to face the reality of their own demise, can extend far beyond selfie obits. If you’d like your funeral to be handled in a way that you prefer, there are many ways you can exert control over how things are handled after you’re gone. 1. Have a will and trust. The most basic piece of end of life planning is to have a will and trust created. These documents allow you to name an executor to handle your finances once you’re gone and also name the people you would like to raise your children, if they are not yet of legal age. Once you create your will, make sure to review it every five to ten years or when a significant life change such as the birth of a child, a marriage or a divorce occur. 2. Talk to your family ahead of time about how you plan to distribute your possessions. You likely don’t want the reading of the will to stir up anger and discord in your family members. Talk to them ahead of time about what sentimental and/or valuable items they may want as well as what you plan to give to each person. That way there are no unexpected surprises after your death. How would you like your remains to be handled? Would you like to be cremated? Or would you prefer a burial? What if you want to go off the typical path and instead have a green burial? Most people don’t like to think of planning their own funeral, but it could save you a bundle of money. 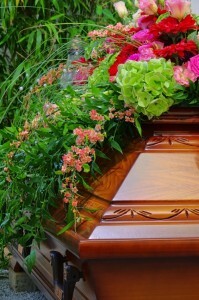 “Consumer advocate Lisa Carlson, head of the Funeral Consumers’ Alliance, suggest that an impromptu funeral is likely to cost much more than a planned event. ‘If you don’t do your homework, it’s like giving the funeral home a blank check,’ she warns” (Mother Earth News). Instead, you can choose ahead of time how you would like your remains to be handled and let your family members know. Think how much easier it would be on your family to know what casket you wanted (no guilt about putting you in the cheapest casket if finances are tight) and what headstone you would like. When a loved one dies, whether it be unexpected or expected, people experience a range of strong emotions. Planning how to handle the remains, write the obituary, and pay for the services are a burden for many. If you can face the reality of your own demise, you, like James Rebhorn, could handle many of the final details yourself, in a way that you prefer, while removing the burden from your family to do so when they’re deep in grief. Would you consider writing your own obituary and making your own end of life plans, or would you prefer to avoid doing so? End of life planning should be right for everyone. Unfortunately, we’re all going to die at some point – either after a long life, or unexpectedly (hopefully not). It’s going to be a hard time for your loved ones, having some basic things planned for, or at least have your wishes communicated will help out a lot. However, it will be a difficult subject to bring up for any family, and discussing funeral arrangements and plans for the day we leave this Earth can only be a torment for our loved ones and very confusing and upsetting for young children (if they’re to be involved in the discussion). It’s an important issue, though, and one well raised.